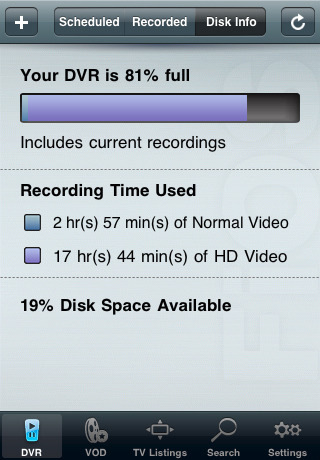 The iPhone and Verizon FiOS go hand in hand with the official DVR manager app for FiOS users. Use this iPhone app to search for TV shows, get airing info, schedule recordings, and get general information about your FiOS DVR at home, from anywhere. Great app for scheduling a quick recording on the go. The app also lets you see what shows you’ve already recorded, what shows are scheduled to be recorded and general disk information on your DVR so you know how much hard drive space is used and available on your FiOS box. The app also lets you search VOD listings. Finally you can now even delete recorded shows from your iPhone. The only annoying issue is that you are limited to 1 iPhone per FiOS account in your household to use this iPhone app. And although there are other apps for that purpose, it would also be great if this app was able to serve as a remote control for your FiOS DVR box while you’re at home. Otherwise a wonderful iPhone app from Verizon FiOS members, and it’s a free service. AppSafari review of Verizon FiOS DVR Manager was written by Joe Seifi on January 11th, 2011 and categorized under App Store, Free, Remote, TV, Utilities. Page viewed 4660 times, 2 so far today. Need help on using these apps? Please read the Help Page.